When the traffic engineers want you to be careful of what may be around the corner, they slow your speed down. That is what is happening right now. Hard to tell what is ahead, because there is both good news and reason for concern. First, let’s look at the economy as a whole, important factors such as consumer confidence and unemployment. 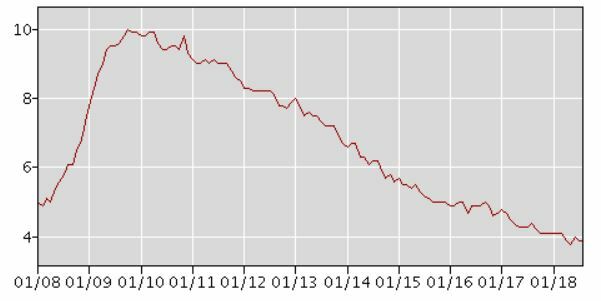 The unemployment rate is so low it has only hit this level a few times in modern history. The last time was in the heat of the dot-com bubble in 2000. But before that you have to go back to the late 1960s to find a time the unemployment rate was lower. Consumer Confidence is another important area to watch, since consumers power so much of our economy. When consumers are confident about the future, they are willing to spend and commit. In particular, they commit to long-term purchases such as homes. 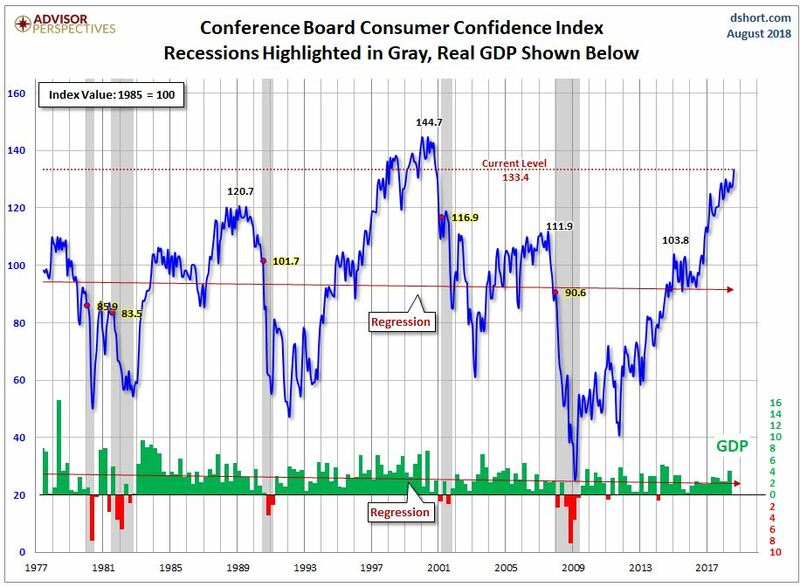 As you will see from the chart below, consumer confidence has only been higher one time than it currently is since 1977. The report was initiated in 1967, and is indexed to 1985 as 100 points. The bottom of the chart shows quarterly GDP. Drops in GDP signify recessions (two quarterly drops in a row) and they coincide to steep drops in consumer confidence. Which one happens first? First consumer confidence drops, then GDP drops. Other important economic factors to consider today are that strong increases in inflation and wages are finally moving steadily upwards. Hard to buy a house unless you have more money coming in, improving your future income and buying power. So now on to the real estate activity in our valleys. Let’s look at the overall statistics first, then look at individual graphs. 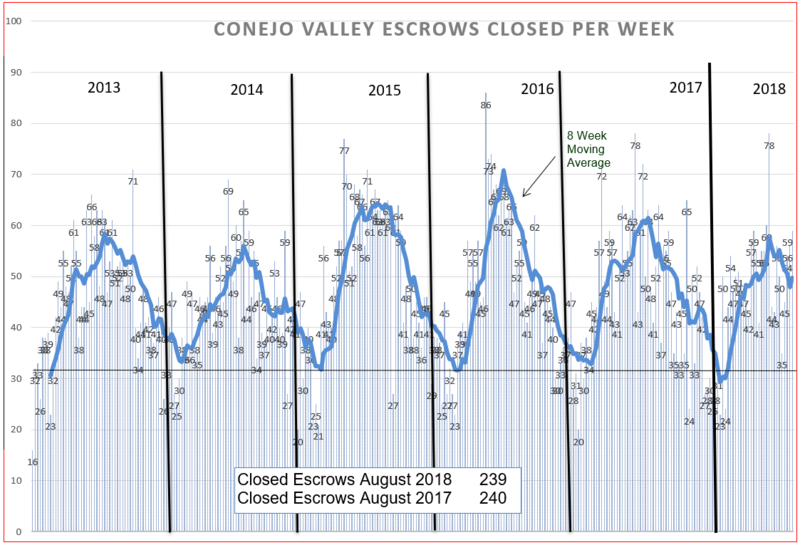 The Conejo Valley has slowed from the same time period last year, a three-months comparison. Inventory is up 20% Sales are down 10%. This has stretched out how long the inventory would last, from 1.9 months last year to 2.5 months this year. And what has this slowdown done to prices? 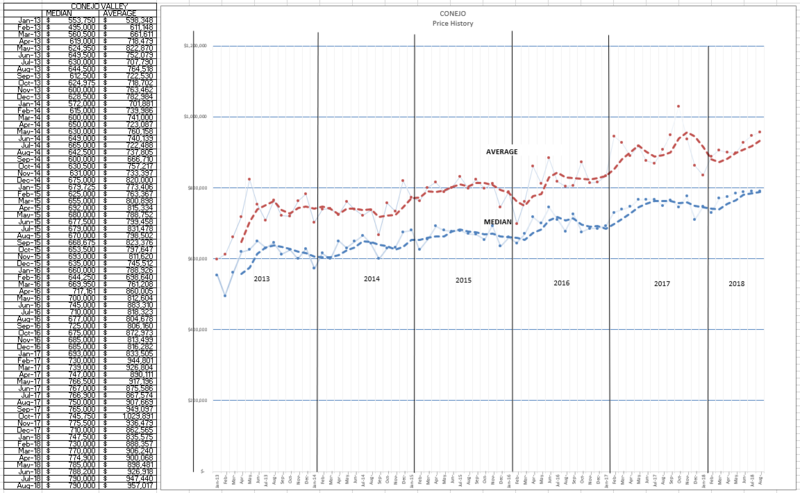 Median prices are up 4%, nearly the current inflation rate. But Average prices are up 10%, due to a shift to higher priced homes. Looking at the bottom of this table, sales of the two lower priced segments are off considerably, 10% and 19% lower. Sales of the highest segment is up considerably, by 32%. Could it be that the new income tax rules favoring the wealthy are having an impact? (more information needed). 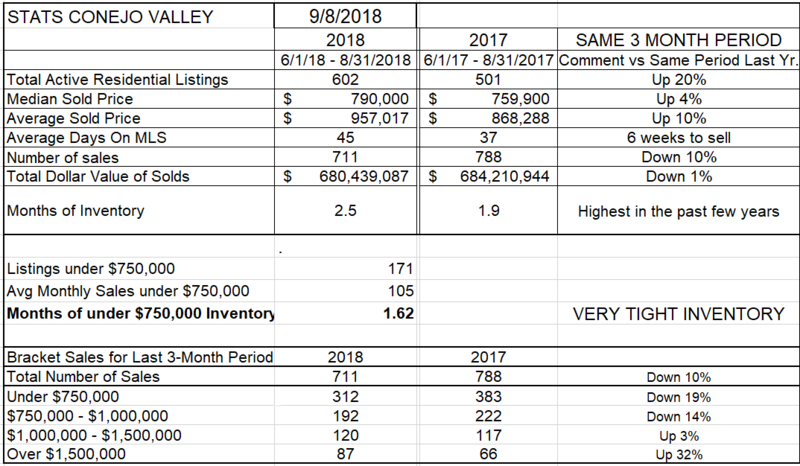 Let’s look at how the current inventory compares to past years. We know it is higher, but does the graph tell us anything worrisome? Not really. 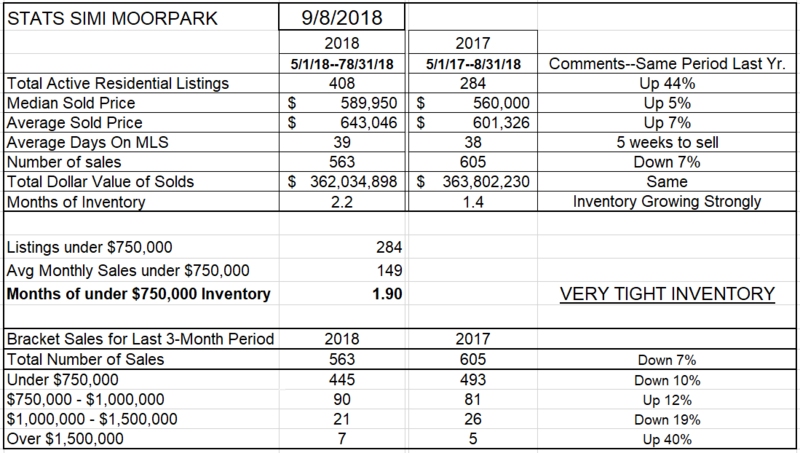 Although we started the year with less inventory than the previous 3 years, the current inventory line seems to be following 2016, and is turning downwards, as expected this time of year. 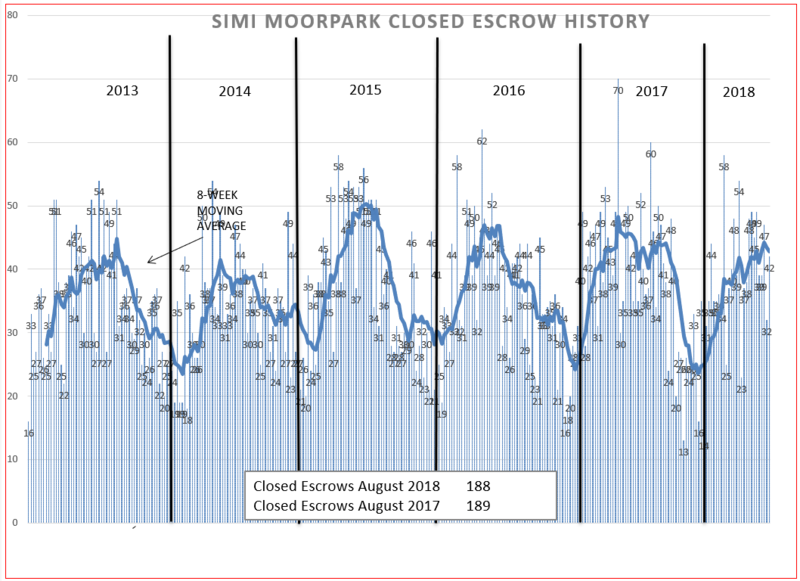 Next, let’s look at the chart of closed escrows, and see if it looks like there are 10% less sales. Yes, it is lower than last year. However, note the numbers in the box on the chart. This August, compared to last August, we sold essentially the same number of homes, 240. That means the slowdown really occurred in June and July, normally our busiest months. Lastly, lets look at pricing. We can see the Average price rising strongly (red dots above the dashed line) but the median price not nearly as strong, actually starting to go down. Let’s see how all this is going in Simi Valley and Moorpark. First, the overall statistics. The inventory is up from the same period last year. 44%. What? Double check the figures. Yes, 44%. Wow. We’ll see what that looks like on the chart. With inventory rising so much, compared to last year, how about sales? Down 7% in the same 3-month period. How has that affected prices? Prices are up between 5-7%, again right around inflation. With such higher inventory and lower sales, how long will this new inventory last? 2.2 months. Not terrible at all, but certainly much higher than last year at this time, only 1.4 months. How does that inventory rise look on a chart? Like a rising rocket. And no indication that the rise is leveling out. Sales, on the other hand, down 7%, looks like this compared to the past few years. Lower than the past three years. But in the box, the month of August 2018 was essentially the same as August 2017. 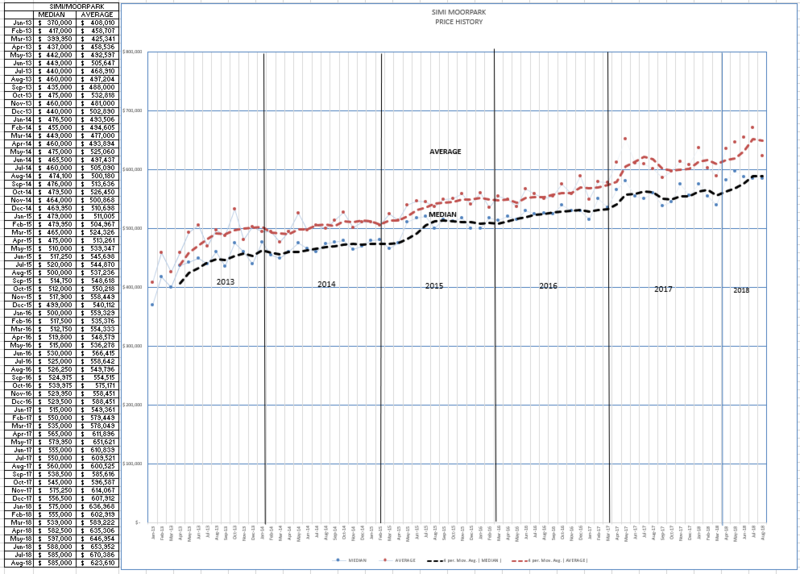 So here again, the slowdown occurred in June and July. And finally, pricing. 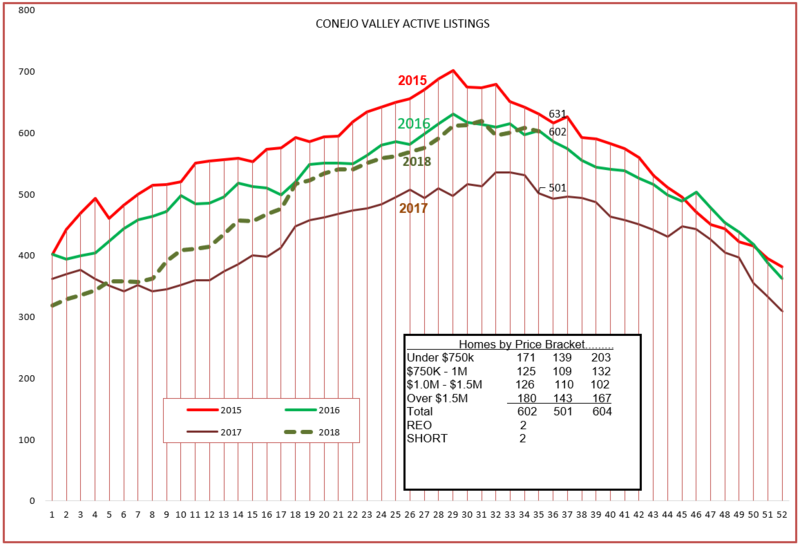 As in the Conejo Valley, same strong average going up and up, while the weakness in Median prices is beginning to trend downwards. Very strong increases over the past two years, from the mid-$450,000 level in 2016 to the mid-$560,000 level in 2018. That gain of $100,000 in prices should please homeowners who purchased prior to August 2016. While this overview tries to tell you what is going on, it is not necessarily what is happening in YOUR neighborhood. 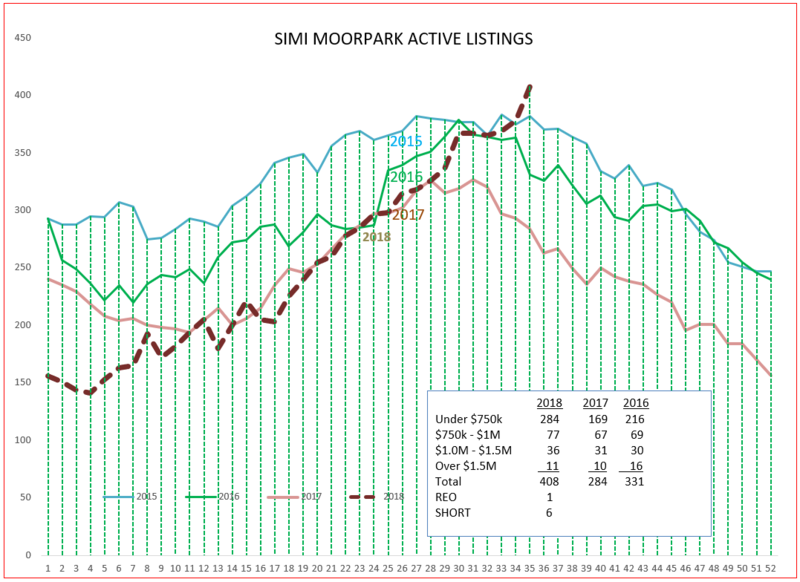 Conejo shows high priced homes doing well. But ask the homeowners in Dos Vientos if they are experiencing that. There is a slowdown overall, but it is not felt the same in all areas. If you want to know what a particular neighborhood is doing, ask a realtor that works that neighborhood. One more interesting piece of information from a report that tracks a lot of numbers in our market. Last month, how many on-market homes decreased their listing price? 55%. More indication of slowing. With the median house rent approaching $4,000 per month, it may be less expensive to buy a home rather than rent. Yes, be careful with your foot on that pricing accelerator. Things are slowing down. Is this market becoming a leading indicator?